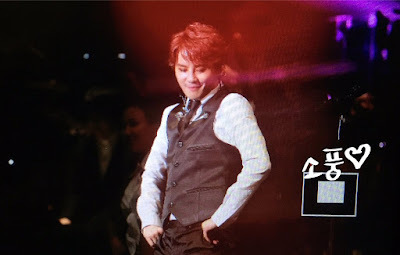 Junsu: Welcome to 2015 XIA Best in Jaaaaaapan in Nagoya! Everyone, we finally met! You wanted to meet me, right? Again! 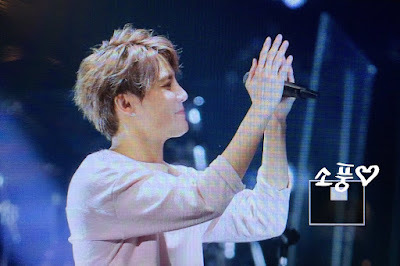 Junsu: It was my first time coming here for my musical ballad concert two years ago. It's 5 years in Korea, and it was my first time in Japan two years ago. There were often talks if I'm going to do a musical ballad concert in Japanese for Japanese fans. Junsu: Something like the stories that time~ I did sing beautiful songs. And again this time! For the Japan concert! Only for this stage! 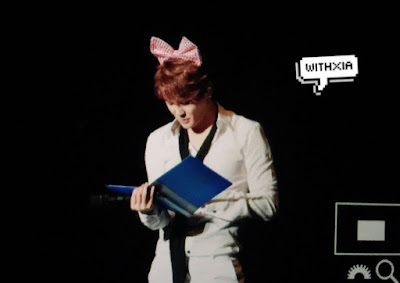 Junsu: L from Deathnote musical... Ah, this manga... everyone knows this. Ah, is my Japanese perfectly fine now? Is my pace quite okay now? 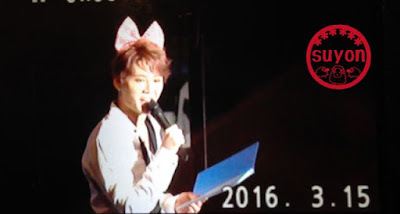 Junsu: (laughs) It was last year. lol. From last year's summer, I played L in the Deathnote musical. I received different awards as L. Haha. I also got a musical award in Korea! Haha. It's all thanks to everyone. Junsu: By any chance, are there any people who went here to Korea to watch my musical? Don't lie. There...are a lot? Thank you! Haha. Junsu: I'm going to sing a song from Deathnote. I'd be singing more Deathnote songs as we go proceed with the concert. 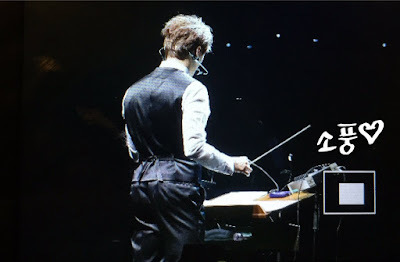 Junsu: Singing three songs consecutively, since I sang musical songs to ballads... how was it? Junsu: This is a Korean artist's song that I used to sing before. Around three years ago? It's a song you heard in the December musical. I was preparing for it while thinking that it would be good if I'd be able to sing this on stage once again. Junsu: [About Love too painful was not love after all] This song that I sang twice already...is not my song. Yes, yes, yes. It's a song of the Korean female duo, Davichi. This song is a song I used to sing at the very last. Junsu: Are there any people who didn't want to come originally... but is currently here now? 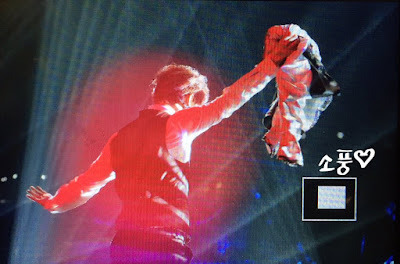 Junsu: Your three wishes, I'd do it on this stage! Everything! I'd do it all! It's a corner like that. So~ let's do this. Three wishes! Junsu: THREE!!! Ah, this song. HUG! Ah, this is (my) debut song both in Korea and Japan. The Japanese fans know that HUG is (my) debut song. 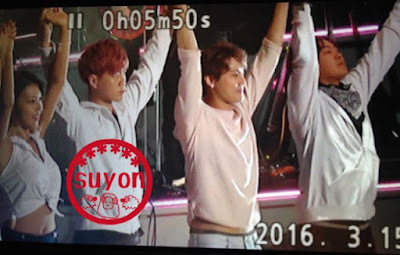 Junsu: Some of the Japanese fans think that どうして君を好きになってしまったんだろう (Why did I fall in love with you?) is (my) debut song. It's actually HUG. Junsu: Why were the lyrics of Toki wo tomete written in Korean? "Here is the korean version of Toki wo Tomete!" is written there. Junsu: Well, the second wish would be from this area! Ahhh!!! You're here again? This man! He's a person who always attends (the concert)... Did you bring hitsumabushi? At first, he brought hitsumabushi with him. Haha. Ah, you only brought it that time? Anyway, thank you! Junsu: Ah! Dance medley! My fans. lol. You guys really prepared. for this. Isn't it really amazing? If it's not musical ballad concert, I would have danced it madly on this stage. But today is a musical ballad concert. Junsu: I can't dance. I'd choose again. The feeling of singing two songsㅋㅋ *pants* Ah... is...it...fun? It's...fun! It's hard. Haha. Junsu: Haha. It's very fierce. ㅋㅋ It would be good I think if the you'd prepare something in the medium tempo next time. Lol. Junsu: I remembered it. Amazing. Haha. It felt like a small test to you...? Thanks. Haha. So yeah. Let's go to the last wish. Junsu: The last one would be from the middle! Ah, whose birthday is it tomorrow? Who wants it? You have a wish? Yes, yes, okay! 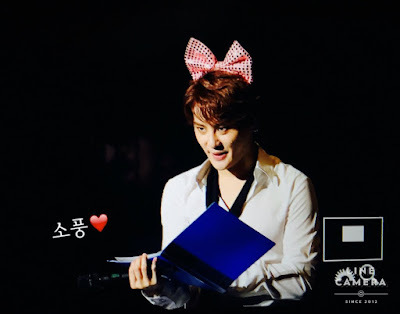 Junsu: Okay...so it's your birthday? Everyone, forgive me. Haha. What is it? Whose birthday is it again? What? Today???? Ah, tomorrow then? 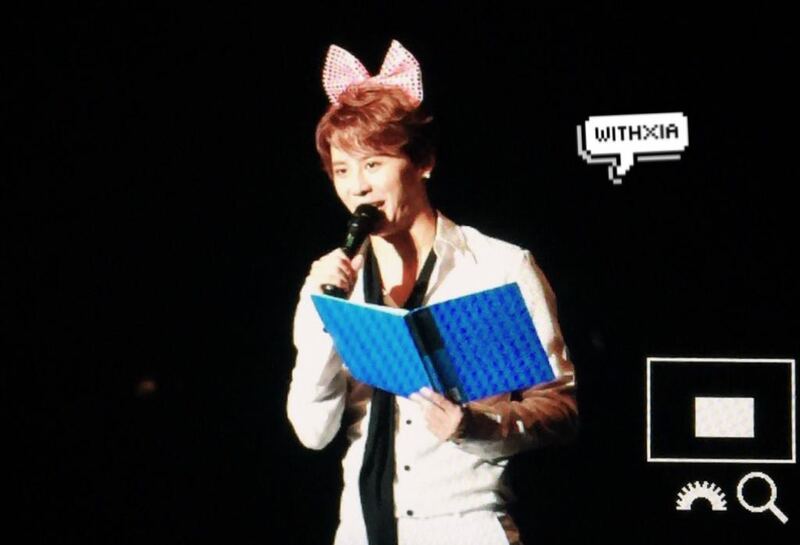 Junsu: "Please read Junko's lines that you used to do in a Japanese radio show. It's really cute." It's my charisma. It was when I was 23. I was aiming for charisma (that time)! But, all of this...? In Junko's voice? In Junko's voice... Ah, I'd do Junko's voice like this. A little bit feminine, right? HAIIII! (Junsu speaking like Junko) Ah, this is Aka-chan(?????)? Junsu: Everyone's idol~~ it's Junko. ♥ What is this...? Ah, just a simple message? Ha... Junko...it looks risky. Junko. Junsu: At that time, I don't know Japanese that well. Junko's a character...that was quite well-known nationwide. Junsu: I prepared a stage with a jazz bar atmosphere. I'd serve you on stage for two minutes. A brilliant artist. Haha. Junsu: It's only for two years, yes? Then on the stage this time. I tried doing it Japanese. I really do love Japanese songs. Junsu: The expression and lyrics of Japanese songs are beautiful. I like the melody, too. So, please listen carefully. Junsu: [Sings Sukima Switch - Kanade] I chose this after thinking that it's nice listening to it. The staff who heard it knows Kanade also. Let me tell U. Changmin wrote the lyric for Korean version. That's why now Toki wo Tomete have kor ver. I need your comment to change my ringtone. Ringtones are free with everyone when installed at my home page. Share to get the most favorite ringtone. thank you!